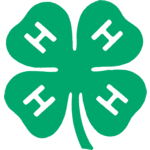 Raymond 4-H is the largest club in Racine County with over 200 members. We meet the first Monday of each month at Raymond Elementary School. Our largest projects are: Arts & Crafts, Basketry, Swine, Rabbits, poultry and Photography. 4-H in the United States and Canada is a youth organization administered by the Cooperative State Research, Education, and Extension Service of the United States Department of Agriculture, with the mission of "engaging youth to reach their fullest potential while advancing the field of youth development." The name represents four personal development areas of focus for the organization: head, heart, hands, and health. The goal of 4-H is to develop citizenship, leadership, and life skills of youth through mostly experiential learning programs. Though typically thought of as an agriculturally focused organization as a result of its history, 4-H also focuses on citizenship, healthy living, and science, engineering and technology programs. We have a great group of members and parents that are very involved. We also have multiple generations of families that have been in Raymond 4- H for many years and we hope for many years to come. For more information contact Jenny Waldron at 262-689-7681 .